Logan Square and Palmer Square are known for wide, tree-studded boulevards and parkways lined by distinguished mansions and elegant two- and three-flat buildings constructed before World War I. Off these grand boulevards are quiet residential streets with smaller homes and two-and-three-flat greystones. Just west of the Kennedy Expressway and DePaul neighborhood, Bucktown has become one of the most vital neighborhoods in the city. Loft conversions, new construction townhomes and single-family residences have attracted a new generation of urban dwellers. The restaurants, shops and coffeehouses appeal to residents and visitors alike. The annual art, music and craft fairs are among the city’s best. 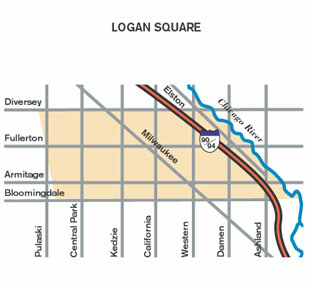 The pioneers in the area are the planned communities of Dearborn Park I and II. Here you’ll find mid-rise condominiums and apartments, townhomes and single-family homes, spacious parks and playgrounds and the developments’ own elementary school. The South Loop is more than new construction. For example, in areas like Printer’s Row, condominiums and lofts occupy former warehouses, printing plants and other historic buildings. It’s an easy walk to work in Michigan Avenue office buildings or LaSalle Street financial centers. After hours, the district is alive with restaurants, boutiques, book and antique stores.